I took one of my classes on a little field trip to a fountain on campus here at Illinois State University this week and asked them to look around and see what they saw in terms of visible rhetoric. They came up with lots of examples, one of which was that the fountain was a visible marker of tranquility. The fountain is also a sign of affluence, of course, because it demonstrates with significant bulk that the university values art/luxury and has the money and space to show off said art. All said and done, the fountain is definitely a visible sign denoting something about ISU; it’s a site of institutionalization. 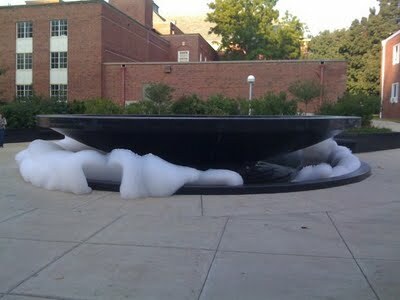 Two days later, I showed up for class and saw that the fountain looked like this. Someone had poured soap into it, thus turning a site of institutional power into a site of rebellion. I thought that was a pretty powerful testament to visible rhetoric–plus I think it’s darn funny.